In the words of Professor Hawking: “With this next edition, STARMUS confirms its position as a unique debating chamber for the future of the human race”. The stars of the international world of science will shine brighter than ever in the Canary Islands during the third edition of the Starmus Festival, to be held on Tenerife from 27 June to 2 July 2016. Under the slogan “Beyond the horizon — Tribute to Stephen Hawking“, the festival programme will be devoted to the best-known theoretical physicist and populariser of science of all time. “I am honoured that Starmus III is titled ‘Beyond the Horizon: A Tribute to Stephen Hawking’. The vision of Starmus became an incredible reality with its first two historic festivals in 2011 and 2014. With this next edition, Starmus confirms its position as a unique debating chamber for the future of the human race,” declared eminent theoretical physicist, Stephen Hawking. 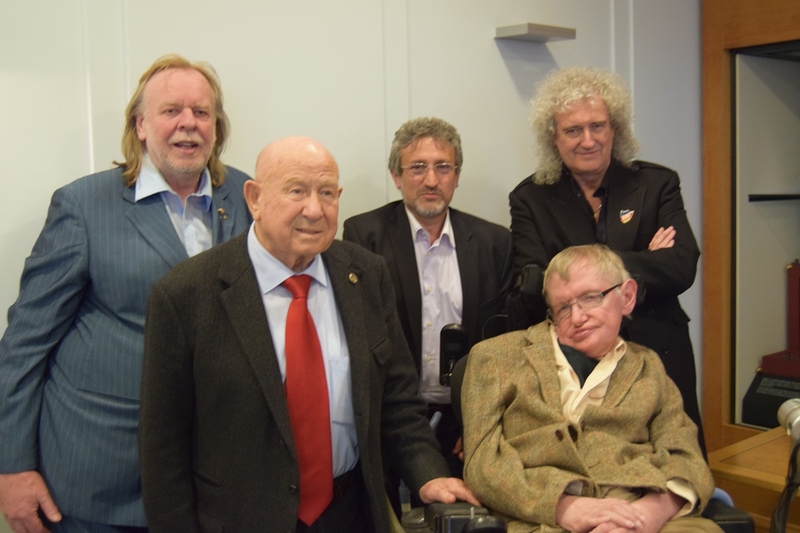 Garik Israelian, founder and director of Starmus, added: “we are very proud and honoured to have the consent of Professor Hawking to pay tribute to him; as a result, the next edition will be a historic milestone on a par with the stature of Stephen Hawking himself“. Considered as one of the most ambitious contemporary science festivals, the next edition of Starmus will feature ten Nobel prizewinners in the fields of Physics, Chemistry and Medicine: Harold Kroto and Eric Betzig (Chemistry, 1996 and 2014, respectively); biologists Carol Greider and Elizabeth Blackburn (shared award for Medicine, 2009); Robert Wilson and David Gross (Physics, 1978 and 2004, respectively); Adam Riess and Brian Schmidt (shared award for Physics, 2011); and the couple Edvard Moser and May-Britt Moser (who shared the Nobel Prize for Physiology or Medicine in 2014). In addition to a glittering line-up of Nobel prizewinners, the festival will feature renowned astronomers, astrophysicists and scientists, including notably astronauts Michael López-Alegría, Garrett Reisman, Chris Hadfield and Russell Schweickart, cosmonauts Alexei Leonov and Sergey Volkov, astrophysicists Neil deGrasse Tyson, Kip Thorne, Martin Rees, Jill Tarter and Robert Williams, and physicist Neil Turok. Based on the variety of the panel of speakers, this international encounter, which has been gaining in strength since it was conceived in 2011, will cover a range of scientific disciplines. With input from the leading figures in these fields, the festival will debate not only astrophysics and astronomy but also biology, neuroscience, chemistry, physics and, of course, space exploration and the great challenges still facing humanity. It will also analyse the diffuse relationship between science and science fiction in the area of technology applied to the future of humanity within the framework of a great, unique interactive show in which the public will have the opportunity to discover, through round table discussions, performances and exhibitions, the magic fusion between science, art and music, including the opportunity to visit the international observatories on Tenerife and La Palma. In addition to the unique tribute and a stellar panel of speakers, the festival also has an Advisory Board composed of well-known figures in various fields, including Peter Gabriel, Alexei Leonov, Stephen Hawking and Brian May. The festival has its own book, “Starmus: 50 Years of Man in Space”, with a prologue by Stephen Hawking, which was presented last September in Southampton, UK, to herald the beginning of the second edition of Starmus in Tenerife at the end of that same month. The magic of Starmus is not confined to science; music is also an essential component of the festival. And Starmus has a legacy in this field too, such as the “Starmus – Sonic Universe” album, released in 2013 by German band Tangerine Dream with guest artist Brian May, one of the most diverse and exciting musical collaborations of all times. A year later, the band NOSOUND presented an album recorded at the Teide Observatory in Tenerife. Famous British keyboardist Rick Wakeman, another of Starmus’s musical ambassadors, gave a memorable concert with Brian May during the last edition, and will be providing accompaniment to Starmus 3 with his video composition “Starmus”, to be released this week on the festival’s YouTube channel. One of the most prominent members of the Advisory Board, the great Peter Gabriel, former leader of UK bank Genesis, highlighted the close ties between astronomy and music: “Musicians explore and define what exists inside us, astronomers explore and define what exists outside of us. That’s precisely what I love about Starmus: the combination of the two worlds“. With an almost unbeatable confirmed panel of great minds, the countdown has begun to the next edition of Starmus, in June 2016, amid considerable international expectation. Over the coming months, the organization will unveil new features and surprises in connection with the world’s top science event, which will raise the Canary Islands to stardom in science once again. Tickets go on sale today on the websites of the festival itself www.starmus.com and of tour operator Kuoni, www.kuoni.es, which is the exclusive logistics operator for the event. Since its first edition, the festival has been supported and sponsored by the Tenerife Island Government through Turismo de Tenerife, its tourist agency, as part of its ongoing bid to position the island as one of the great meeting places for the astrophysical community thanks to the privileged conditions of the Tenerife sky, coupled with the experience of astronomical observation and research accumulated by such world-class institutions as the Institute of Astrophysics of the Canary Islands.